Do you also feel that your party makeup or dress-up for any other social gatherings is incomplete without wearing your favorite pair of high heels? If yes, then I can’t blame you as you are just one among the millions of girls who love wearing their high stilettos. But did you know that there are many side effects of wearing high heels? From joint pain to lower back pain, wearing high heels for long can seriously affect your entire skeleton and body posture. Wearing high heels occasionally is okay, but if you wear high heels regularly and for long hours, then you should better know about long term side effects of wearing high heels. Today, in this post, I am going to talk about various long term side effects of wearing high heels. The fashion world is flourishing day by day with increasing number of young women getting addicted to it. They do not hesitate in copying every latest fashion trends that comes every season. One such trend that never goes out of style is the craze of wearing high heels. Most actresses and models flaunt their toned legs with short dresses and a pair of perfectly matched high heels which catches the attention of girls all over the world. While wearing such sharp high heels may definitely add to the oomph factor, but in reality, it has got a number of side effects and disadvantages. And I seriously think that every girl that wears high heels should know about the long term side effects of wearing high heels for their own safety. I have observed many young girls who hardly can walk properly but still cannot get rid of the idea of not wearing those high stilettos. Well, I seriously think that it is a matter of concern and it is high time we recognize it before it gets too late. Today, I will be talking about 17 of the major side effects of wearing high heels continuously for long hours. Knowing about the side effects will help you decide when and how frequently you should wear those matching high heels. In the craze of copying the glamour world, young girls adopt many such trends which are otherwise not good for them. Excessive addiction to high heels is one such trend. Well, I see no need of wearing high heels for a girl next door who already have a good height. It is simply like forcefully welcoming the pain and the other side effects of wearing high heels. You may any day fall and break a bone or have other fatal injuries. And, as far as girls who are short, I think it is best to flaunt your natural height. What is more important for you is to come across as a person with immense confidence that will wash off every hurdle and insecurity that comes your way. Wearing high heels is never a solution for anything until and unless you are part of this competitive glamour world where you have to wear high heels whenever you are at work. 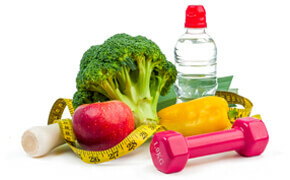 However, the good part is that nowadays more and more articles are being written considering this problem, and many are trying to create awareness among the young girls. Indeed, it is important to know about the various long term side effects of wearing high heels, and today we will learn about it in details. So, lets us start without further delay. Wearing high heels enhances the beauty of the toned legs, but one should not ignore the negative consequences of wearing high heels, regularly and for long hours. Some of them may have long term serious consequences which may not get cured easily. So, I strongly feel that creating awareness is essential and hence this list of 17 side effects of wearing high heels. Check these out and decide wisely when you want to wear high heels next time. The stylish stilettos may look cool but they are not even close to comfortable in most of the cases. The high heels do not support your feet properly which leads to all the problems. Studies have already proved that wearing such sharp high heels leads to distribution of body weight unequally which in turn triggers the soreness, swelling and lower back pain. And, if you still continue wearing it regularly for long hours, then things might even get out of hand. One of the other side effects of wearing high heels is the problem of sore calves. It, at time causes protruding veins which is not just appalling to look at but also are extremely painful. Therefore, if you want your legs to remain properly toned, it is best to watch the frequency and duration of wearing high heels. The shape and the design of most of the high heels or stilettos may look fashionable but when you wear it for a long time and walk, then the discomfort increases and may lead to severe pain in your foot. You will slowly experience the pain in your arch, toes, sole or heel just after few hours of wearing them. As you get used to wearing high heels, you may start ignoring the pain, but in longer term, this is not good for your feet. The fashionistas who have got hourglass figure love wearing high heels that helps them to flaunt their body. In other words, wearing the high heels enables them to arch their lower back more than usual. To be more specific, the height of those high stilettoes is in direct proportion to the degree of that arch in the lower back. So, when you stand, or walk for long hours with that awkward arch, it is bound to cause terrible pains in both the upper and the lower back portions of your body and studies are a proof of that. If you notice someone wearing the high heels properly, you will see that the legs appear to be thinner and longer. The main reason behind it is that the shape of the high heels squeezes the foot in an uncomfortable position and it is certainly not even close to being natural. This excessive stress can actually lead to constricted flow of blood, and in extreme situations, it can result in the breakage of your blood vessels. So decide and wear high heels wisely. One of the other dangerous side effects of wearing high heels as stated by the Medline Plus is that it can deform the usual shape of your feet, popularly known as the hammer toe. Well, wearing those uncomfortable stilettos puts your foot in a very unnatural position, leading to a lot of strain and stress on your calves, back, and blood vessels and hence hammer toe is one of the obvious consequence that a girl has to face in the long run. Unlike most of the shoes, these high heels do not have shock absorption. In addition, they restrict you from naturally rotating your feet while you are walking as they are forced into an unbending straight position. This as per several studies, results into our knees absorbing the brunt of every step that we take which can easily lead to severe pain in your joints, and can also start giving symptoms of arthritis. Even the ankles absorb most of the shock and so if, at the end of the day your joints become stiff and sore then do not get much confused. Hence, we can easily say that although the problem of joints occurs with age but if you are wearing high heels all the time, then there is every possibility you will get affected with the pain in your joints quite prematurely. When you are wearing those uncomfortable heels, you literally push your feet in those very tight shoes or force your feet into unnatural shapes like in the case with the pointy-toe shoes. This puts excessive pressure on the sides of your toe and feet. Excessive rubbing and pushing from your high heels makes the skin very hard. Now, this might not be a problem during winter as your feet will be mostly covered. But with summer, whenever you feel like wearing strappy sandals, you will surely feel embarrassed to don the feet that are riddled with callouses. As per Livescience, girls who wear high heels for a long time in their lives can face the consequence of shortening their Achilles tendon. Due to the heel in an uplifted position, it can actually create a change in the physiology in the tendons and the muscles around the ankles. Hence, when you will be barefoot or will wear flats which will make your foot heel to reach the ground, it will then cause stretching and terrible pain. Most of the high heels have almond shaped or pointy toe despite the fact that your feet are more or less a square at the end. And since almost all of these high heels are extremely tight, you have to forcefully slide down and crush your toes which in turn lead to in grown toenails. So, when your nails start growing inside your flesh, it is an extremely painful symptom to bear. If you already got existing bunions, it is a must that you avoid wearing the high heels, as the high heels will make the situation even worse. The main reason behind that is the high heels tip the weight of the body in the forward direction which forces your toes to the front of your shoe. This automatically results your big toes against the other toes which leads to worsening of the bunion protrusion. Wearing those high heels for a long time can actually put a lot of unnecessary stress on the ligaments, which over the time, can actually cause weakening of ligaments. Weakening of ligaments is one of the major side effects of wearing high heels, and if you want to avoid it please mind the frequency and duration of wearing high heels. Many of us may be unaware, but wearing such high heels for a long period of time can lead to Morton’s neuroma. It is the height and the narrow toe box that causes the thickening of the tissues around the nerves, in between your toes, causing the symptoms of the Morton’s neuroma like numbness, weight bearing pain and paresthesia (tickling skin sensation). One of the other side effects of wearing high heels besides the several other health complications is that it fixes your toe in a position of permanent hyperextension which is not something even close to natural. So, it is best if you can avoid wearing these sharp heels for such long hours. It might seem surprising, but wearing high heels for a longer period of time can cause vocal cord damage. The main reason behind this is that, when you wear those uncomfortable high heels, it can lead to improper breathing and projection which can take a severe toll on your delicate vocal chords. An article has already been published by The Times which clearly shows that wearing such heels all day long result in faster and shallower breathing and can also affect the cords. The other vital side effect of wearing the high heels is that it can cause damage to your nerves and lead to severe pain. The Spine Health Institute has stated that continuous wearing of these high heels may result into a nerve condition known as foraminal stenosis. Here, a person experience symptoms of shooting pains along with numbness, muscle weakness, tingling, spasms, cramps, and pains that moves through your buttocks to your legs. Last but not the least, one of the biggest side effects of wearing high heel is that it increases the chance of accident. The funky and stylish high heels are meant for style and not for safety purposes. Hence, you can walk wearing these heels only when the surface is even. It is not that it will be 100% safe but at least it is better than uneven surfaces. This is because the bumps, potholes, cobblestones are enough to make you slip and strain your ankles. In fact, studies have already concluded that ankle sprains have almost become inevitable if you do not wear high heels with utmost caution. Moreover, not just spraining of ankles, such falls can lead to other accidents as well like bruised elbows and knees, broken ankles etc. And, if you land in an awkward situation, then it may cause a concussion even. So, please avoid wearing the high heels on uneven surfaces. I would firmly suggest you to stay away from the high heels but if it is your job or you cannot even stop wearing these heels, then I request you to wear such heels with utmost caution. You already know by now about the major consequences and negative side effects of wearing high heels. So for safety purpose, I want you to consider some of these tips on how to wear high heels comfortably and correctly. I have jotted these in an attempt to make wearing heels safer and make the shoes more wearable. If you are obsessed to wear high heels, I would advise you to opt for the platform heels. In other words, go for the shoes that have a platform even in the front of the shoe. This is a far better option to try because it gives you the look of the high heels but raises both the foot heel as well as the ball of the foot which in turn exerts comparatively much less pressure on your ball in general. A heel of 3 inches having a 1-inch platform gives a feeling more like 2 inches. See, wearing such heels frequently for an elongated period of time is not at all recommended. You can max wear it for 3 hours or even less. In case, you are out to party where you have to dance, walk or stand for a long time, it is always better to carry an extra pair of stylish flats (folding plats that easily slip inside a purse is a good option to try in this case) so that you can easily switch to that after wearing the high heels for 2-3 hours. This will save your toes, joints and the back. Many girls are of the conception that flats are not something which can be attached to glamour and so it is the high heels that are best suited for the party wear. But, that is wrong because there are many embellished flats that serve as the perfect alternatives to the uncomfortable high heels. With little more of the detailing like bows, studs, lace etc., these flats can actually look real cool. However, if you any way hate flats, then maybe you can try out a pair of sleek flat riding boots. To make your uncomfortable high heels more wearable, you can easily add orthopedic pads or insoles to it. Since, most of the high heels are quite hard to be properly fitted in, these thin gel pads actually work great. They may be small but can provide you enough support under the ball area of your foot or throughout the entire sole which makes the heels wearable. Wearing high heels is never safe but if you really cannot live without them, then it is better that you go for high quality branded high heels which may be costlier but will definitely be a little more comfortable and wearable than the usual regular ones. Clarks, Sofft, Aerosoles and Naturalizer make better high heels, so you may try these brands. If your foot aches after wearing the high heels for a day, then sit on your sofa and then place a tennis ball or golf ball underneath your foot. After that, roll the ball up and down the foot and make sure you apply some pressure on the ball while doing that. This will give you enough relief from the tight muscles and tendon after a hectic day with the heels. Being fashionable is not something which is bad but when you blindly copy certain fashion or style statements which may otherwise cause severe health issues later, then that is a problem. Like for example, you may be wearing the high heels after seeing your favorite role model wearing it. But, she may be wearing branded pairs with utmost protection, which you fail to notice and instead face the problems later. Awareness is of utmost importance here to stop young women from wearing high heels without much caution. 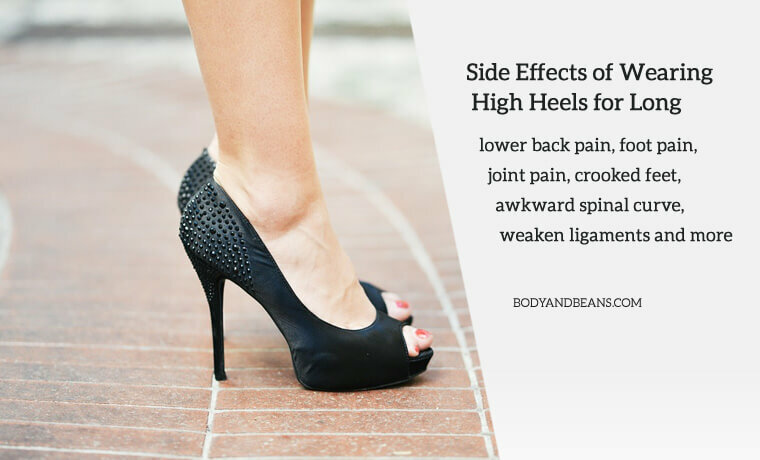 Several studies have been done on the various side effects of wearing high heels and I have already discussed the top 17 side effects in details. As you can already see, that most of them are scientifically proven and hence you have to be extra careful while wearing high heels, especially for long hours. You just can’t wear those uncomfortable pairs out of temptation and then face some accident which may cause permanent damage to your body. Therefore, you have to be careful from the very beginning before it is too late. Well, due to these above-mentioned side effects, I do not at all suggest young girls to wear these high heels. But if you still cannot control the excitement or if you are a part of the glamour world and have to wear those high heels, then please follow the tips that I wrote regarding wearing high heels. I believe that these will enable you to make your wearing heels a bit more comfortable than before. At the end, I would like to repeat that please be cautious before wearing the heels, frequently and for long hours. Do not wear them unless you are fully confident. And, once you have tried out my tricks, please give me the feedbacks and share your experience. And, if you have any suggestions, feel free to tell me that as well. I would also highly appreciate if you give me various topic ideas that you want me to write on. Until then, stay happy, stay safe and do like, comment ad share my post if you find it valuable.